‘The Tradition: The Lady of the Lake was the foster-mother of Sir Lancelot and raised him beneath the murky waters of her Lake. She is, however, best known for her presentation to King Arthur of his magical sword Excalibur, through the intervention of the King’s druidic advisor, Merlin (Myrddin) who was constantly worried that his monarch would fall in battle. Merlin had met the Lady at the Fountain of Barenton (Brittany) and fallen so deeply in love with her that he agreed to teach her all his mystical powers. The lady became Merlin’s scribe, who recorded his prophecies, as well as his lover. Unfortunately however, over the years, the Lady became so powerful that her magical skills outshone even her teacher and she imprisoned him in Glass Tower (or similar dungeon). To some extent she stepped into Merlin’s role at King Arthur’s side, but the old man’s removal contributed considerably to the great monarch’s downfall. 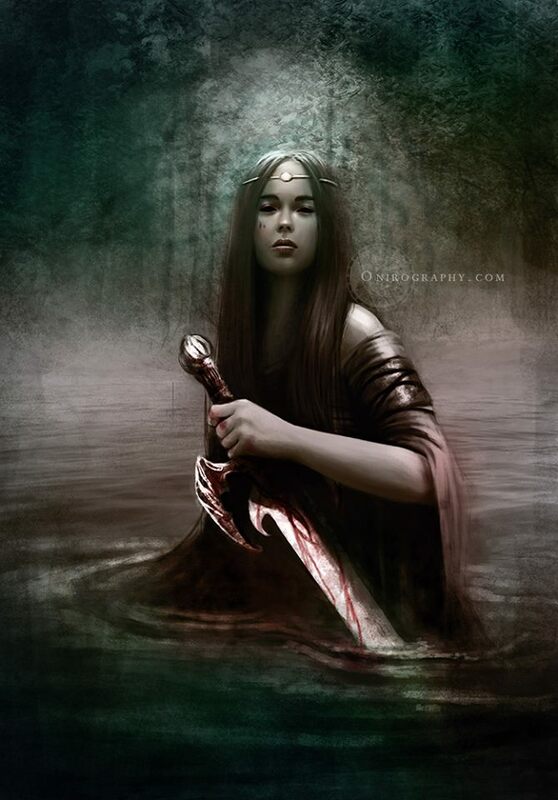 The Lady of the Lake was eventually obliged to reclaim her sword when Arthur was fatally wounded at the Battle of Camlann and Excalibur was hurled back to misty waters. She was later one of the three Queens who escorted the King to Avalon. Her Name: The Lady of the Lake is usually referred to by various spellings of the names Nimue or Vivienne. Nimue is thought to be related to Mneme, the shortened form of Mnemosyne, one of the nine water-nymph Muses of Roman and Greek Mythology who gave weapons, not unlike Arthur’s sword, to the heroic Perseus. Vivienne betrays the Lady’s Celtic form, for “Vi-Vianna” probably derives from “Co-Vianna”, a variant of the widespread Celtic water-goddess, Coventina. Remembering Latin pronunciation, this name probably relates to Merlin’s original partner in early poetry, his wife Gwendoloena. 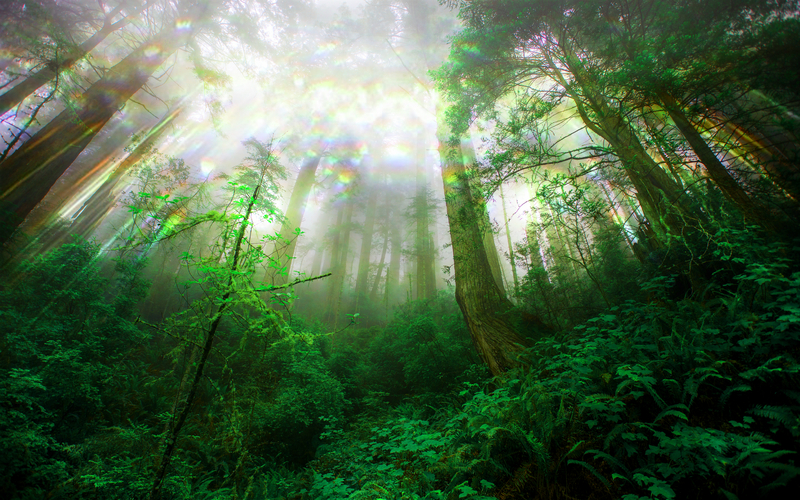 Thus Gw-end(-ol)-oena = Cov-ent-ina. There have also been attempts to show Vivienne as a corrupt form of Diana or Rhiannon. Though possible, these theories seem unlikely. Ancient Origins: Water deities were extremely popular with Celtic Society for they controlled the essential essence of life itself. The spontaneous movement of springs, rivers and lakes clearly showed the supernatural powers of the goddesses who lived within; and offerings at such aquatic features were commonplace, especially of weapons and other valuables. The practice continues today at wishing wells across the country, and the Lady of the Lake is remembered as “Lady Luck”! Her names clearly reveal this Lady to have been the Celtic Water-Goddess Coventina (presumably identified by the Romans with their Mnemosyne). This lady was worshipped throughout the Western Roman Empire, in Britain, the Narbonne area of Gaul and North-Western Iberia too. She is most celebrated for her shrine at Brocolitia (Carrawburgh) on Hadrian’s Wall. Here a quadrangular temple surrounded a central pool fed by a sacred spring. Coin, jewellery and small bronze figurine offerings have been excavated as well as numerous altars dedicated by the local soldiers.